During my studies at The Graduate Institute my life was tremendously enriched by the monthly required readings. I use the term “required” loosely because although it was essential that every student select, read, and reflect on a book on healing every month, the choice of book was completely up to that student. What an amazingly freeing concept! I got to read what I wanted to read not what someone else demanded. Still, during that time there was no shortage of suggested readings offered from colleagues, coordinators, and instructors. In fact, I kept feeling overwhelmed by the notion that there were not enough hours in this lifetime for me to read all the works that I truly wanted to. But, I came to realize nearly everything I chose to read over the course of the 22-month degree program was life-changing. Even more exciting, I kept selecting books on instinct only to find that the book’s message was incredibly pertinent to my life at that very moment. It felt like Divine intervention for sure particularly for a writer who rarely gave herself time to read. Reading a book a month can be exhausting however, so by the time the program winded down in July, I was ready to take a break. You can imagine my surprise when the most blessed book presented itself the week before my last class. I was on the annual family vacation with my in-laws, a trip which one of my friends lovingly refers to as “getting Traubetized,” because even when you love them, spending several days with a dozen or so in-laws can be a trying experience. And, while in years past our trips to Old Orchard Beach, Maine were a bit “challenging” this particular trip was pure peace. Even though I was often stealing away to my room to work on my culminating project for school (this very website), I felt filled with joy, and the amazingly beautifully weather we were having certainly didn’t hurt. The trip actually flew by so quickly that we hadn’t even ventured into town until our last night there. Our eldest niece and nephew (Danielle and Billy) had informed us that there was an amazing new discount book store in town that we just had to see, so that was one of the first stops on the agenda. In my mind I was just along for the ride, because I definitely did not need any more books. I had already filled the many bookshelves in my house, and even had an entire armoire stacked with books and magazines to be read. Still I was a good sport and I followed the kids I so adore into the store. I was instantly drawn to a book with a flying pig on the cover. I picked it up with a laugh, thinking, “Oh my God, I need to buy this book for ‘Chelle.” Chelle is my best friend with whom I share a longstanding joke/obsession surrounding pig items. She is still way ahead of me in the whimsy department after finding “Ballerina Pig” and “Surfer Pig” ornaments, along with a magnet (which resides on my fridge) displaying cartoon pictures of pigs blowing bubbles from their butts with the caption “Why you never feed pigs bublegum. – Massachusetts.” Seriously! There is a grammatically (and literally) incorrect magnet sold in Massachusetts rest stops which is seemingly designed to promote the state. You can’t make these things up – which is true for the remainder of my tale. So here I was holding this fabulous pig find in a hardcover book, that get this, was only $3 (my favorite number and the number of the holy trinity I might add)! I would have paid much more for a gag gift, so the purchase was a no-brainer. Just for laughs I decided to read the back cover to see what such a silly book could really be about. When I did I said out loud one of my favorite sayings about my always amusing, never believable life – “You have to be kidding me!” The back cover spoke of “an all-true accidental spiritual adventure that led one nonbeliever to lunch with Deepak Chopra, dance with Stephen Hawking, health with Yogananda, banish evil spirits with Buddhist Lama…and learn an abiding respect for all paths to God.” As someone who had been finding herself on the path to God it was clear that this book was no joke. Also clear – Chelle wasn’t getting that copy. That book was meant for me! Not any less amazing, I turned the corner in the store and found a huge manual of natural healing that covered virtually every topic that I was writing about for this website for a mere $9.99. 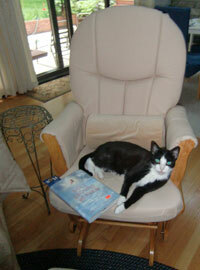 I left the store happy as a pig in sh*t.
Even Gladys can’t get enough of this book! Given the impending presentation of my culminating project for school, followed by the commencement speech I would be giving for graduation, followed by my high school reunion, my little pig book took a back seat and didn’t get opened until just last week. In fact, it was the freewheeling energy of Labor Day that finally gave me the opportunity to open my heaped full armoire, reach for Roll Around Heaven (the book’s actual title), and finally dig in. Within the very first few pages I was mesmerized. 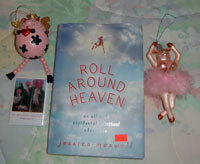 The author, Jessica Maxwell, hit on nearly every obstacle I have ever had in my own path toward spirituality. She laments about hypocritical church-goers and religious zealots who cruelly shun anyone who doesn’t follow their faith. And, in uplifting, humorous detail she highlights her own exciting journey. I hate to give too much of the book away because I felt like reading it with an open heart and no preconceived notions enabled it to have such a powerful impact. I had so many in the words of Oprah, “a ha moments” that I was jumping out of my skin. Even the simple fact that the rocking chair I had ordered the week before, after waiting a year for it to drop in price by a whopping $40, arrived the Tuesday morning that I was really read to dig into my reading seemed like a sign that I was meant to read that book at that very time. The book itself was surely a blessing and when I realized how I had stumbled upon it I couldn’t help but get weepy. All week I fought back tears as I would take breaks from my reading so that I could digest the messages and savor each page. I honestly didn’t want it to end! Long story short – if you have ever wondered what God is really all about and why so many religious folk seem to get it wrong – read this book. I hope it will bless you as much as it has me. Oh, and Chelle, your copy is on its way 🙂 .